I don't often get the chance to shop for homely bit and bobs, because we're constantly saving and prioritising money in preparation for our next home renovation project. The finishing touches just end up having to wait.. and wait. But after a bit of Christmas-pressie shopping at TK Maxx, I just couldn't resist a few little things that were super bargains. And so, I thought I would share! This might be a bit of a boring one, but we were in desperate need of some towels, particularly since taking some on our trip to Thailand and leaving them there. Not one of my greatest decisions, but we needed the extra baggage space upon returning home!! But since then, we've been significantly down on towels, so I thought it was about time I got some more! I found these grey and white options by Christy which were perfect. I spent around £25 on two large towels and two hand towels. We haven't had new towels in about 4 years, so this certainly excited me a little... Oh they're so fluffy!! This truly has no purpose - it was just one of those items I spotted, loved and decided I needed to buy. This would be perfect on a dressing table hosting make-up brushes and perfume, but right now it sits wrapped up waiting for the day I actually have a dressing table and a finished bedroom. I do love it though, can you believe this just cost £10?! It's made from concrete (I think!) and has a moulded swirled top protected by a layer of glass. I love it, it's very different to any other kind of vanity tray I've seen before! We still don't have a wall mirror in front of the basin and although I have been eyeing up one from John Lewis, it's a rather pricey option that I just can't justify right now! I shall just keep on saving... But in the meantime, we needed something else. I spotted this in our local TK Maxx and sapped it right up. It's well made, sturdy and I love the dark gunmetal finish on it. In all, this was right up my street! Plus it was the bargain price of just £12! Before we went to Thailand, I spent so long searching for the perfect make up bag. I wanted something flat, big enough to fill with my essentials, but not the size of a handbag. But alas, I found nothing. Most make-up bags are structured and quite wide - but I don't have that much make-up and something flat would take up far less room in my life. But a few months on, I spotted this! It was actually in the purse section... so maybe it's meant to be a clutch bag? Who cares, it's a make-up bag now! It's real leather (I have massive love affair with leather) and just gloriously beautiful. At £15 this was definitely pricier than I would have liked, but I just couldn't resist. This one was from Amazon and a little bit of a weird purchase. This isn't a decorative jug in any sense, but actually this is how we transport hot water from the shower to our basin. What the?! In short, we do have hot water but since it's heated electrically, it costs a friggen bomb! To combat these costs, we only heat the water when we want a bath and generally we limit this to just once a week (if that!). I don't mind not having hot-water on demand, except for when it comes to washing my face at night and in the morning. So to solve this issue, we now fill up a jug from the shower and pour it into the basin. It takes barely seconds to fill, so whilst our electric shower isn't exactly cheap either, it's still much cheaper than heating a whole tank daily. 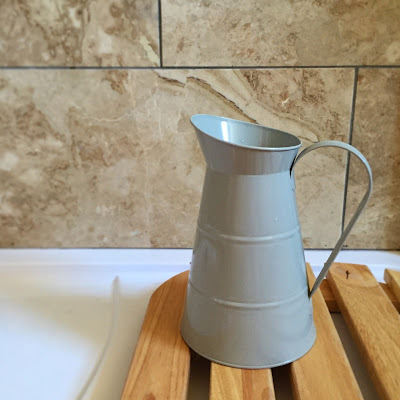 I went for grey to match the panelling, it's a 2.3L jug and from Living Nostalgia and cost just £13. I spent a little more than I would have liked, but I think they were all well priced and I'm super pleased with them! What's your favourite?